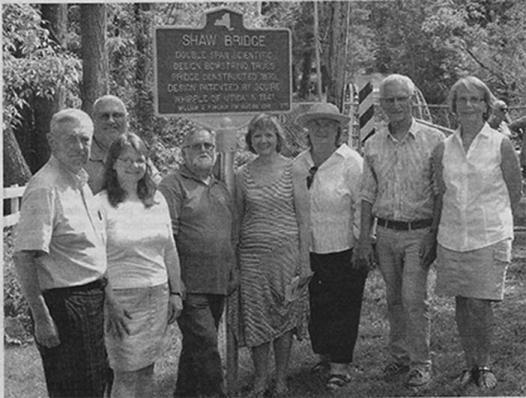 Photo Caption: Attending the installation of the state historic marker at Claverack’s Shaw Bridge were (l to r) former Supervisor Jim Keegan; current Supervisor Clifford Weigelt; former Supervisor Robin Andrews; Deputy Supervisor Stephen Hook; Councilwomen Maryanne Lee and Katy Cashen; Chairman of the Claverack Historic Preservation Advisory Committee Ian Nitschke; and president of the Claverack Historical Society Jeane LaPorta. On May 28 residents of Claverack gathered at the intersection of Van Wick Lane and Shaw Bridge Road to dedicate a shiny new New York State historic marker that has been installed at the Shaw Bridge where it spans the Claverack Creek. The bridge has been closed since 1988, but through the efforts of concerned citizens, many of whom were in attendance that Saturday, it has been protected as a significant object of 19th century civil engineering.